An 88-year-old man arrested on suspicion of murdering an elderly woman in Bolton has been detained under the Mental Health Act. Police were called to Ramsay Avenue in Farnworth, Bolton, at 08:10 GMT on Wednesday, and discovered the body of the woman, thought to be in her 80s. 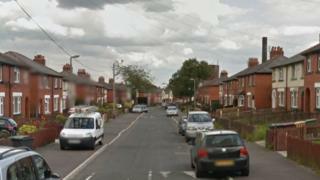 Greater Manchester Police said it was treating the woman's death as a domestic incident. The house has been sealed off while forensic specialists examine it. Det Ch Insp Stuart Wilkinson said: "This morning we've sadly had to inform a family that their loved one has died. "We will be supporting them through this extremely difficult time." The woman is due to be formally identified on Friday. The 88-year-old man was detained under the Mental Health Act following assessments by specialist medical staff.